You’ve got to be kidding me, I thought, looking at the frequency list for Double Eagle II. I have to keep track of five different radio frequencies? I opened the airport information box in my iPad’s “app,” and being careful to keep my fingers just above the touch-sensitive screen, I counted. One… Two… Three… Four… Five! 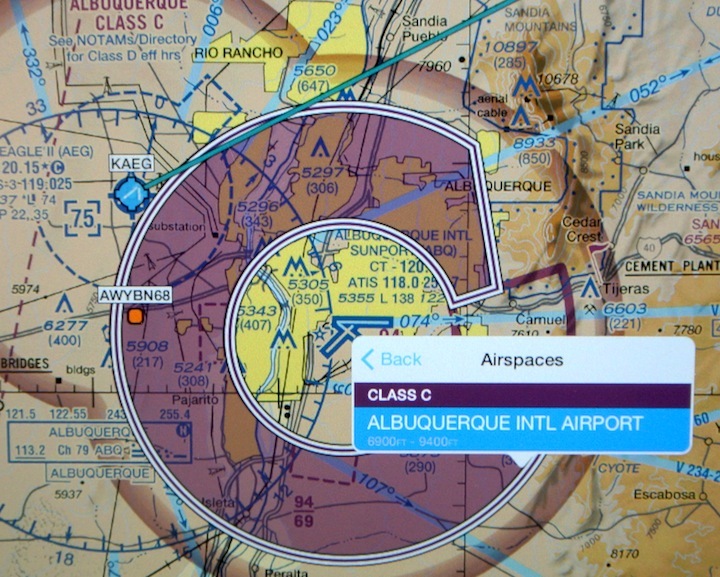 First, at 119.025, there’s the AWOS-3PT, an automated broadcast of general airport info that includes things like the recent winds, the active runway, current altimeter setting, closed taxiways, and in the case of Double Eagle, a warning about wildlife in the area—a common issue here in New Mexico. In fact, as I was gassing up Tessie at our home base a week ago, a half dozen deer stampeded by me on the apron, crossed taxiway Alpha, pranced across runway 01-19, and leapt elegantly over the high-security TSA fence designed to keep terrorists out of my backwater airport. Then, right after hangaring the Plane Tales Plane, I nearly ran over two wild turkeys as I left the airport. Sorry, my mind wandered off into the wild for a moment. Of course, it never fails that the tower updates the info right as you are changing frequencies. Then the controller can then caustically reply, “Ercoupe seven-six hotel, the current information is Delta.” This is why I hate controlled airports. After the AWOS/ATIS there’s a clearance-delivery frequency at 124.8 MHz. Next, at 120.15, is the tower. Then 121.625 is ground control. Uh…. Wait a second. There’s a departure frequency, but not an approach frequency? So who do I call to ask permission to enter their airspace? The clearance-delivery folks or the tower? My palms were getting sweaty as I anticipated making a fool of myself, yet again, with sarcastic air-traffic controllers. Naturally, before we left on our cross country trip, I wrote all these radio frequencies down in large block letters on a sheet of paper. Then I secured the sheet of paper to my blue jeans with two pieces of duct tape. (I really should invest in a good kneeboard.) In most planes, you could just look up the frequencies on your iPad, flight chart, or Airport Facility Directory as you needed them, but of course Tessie isn’t like most planes. You can’t take your hand off her yoke for one second or she’ll enter a climb or start to dive. If you take your hands off her for a dozen seconds to look up a frequency, by the time you’re done, you’ll find the horizon wasn’t where you left it. Adding to my stress over what seemed like an excessive number of radio frequencies was the fact that this was the first time that Rio and I were visiting the “Big” city—Albuquerque—from the air. Yeah, I know, at just over half a million people, Albuquerque isn’t all that large by national standards, but consider that a quarter of our state’s population lives there. And from an airspace perspective, it’s a much bigger deal than what we’re used to, where we’re the only airplane based at our home field. Of course, to make matters even more complicated, in addition to Double Eagle II, there’s a large international airport smack in the middle of the city, with it’s upside-down wedding cake of prohibited Class C airspace dominating the scene. You can get into all kinds of hot water blundering into a large airport’s airspace without permission, not the mention the risk of being mowed down by an arriving jetliner. 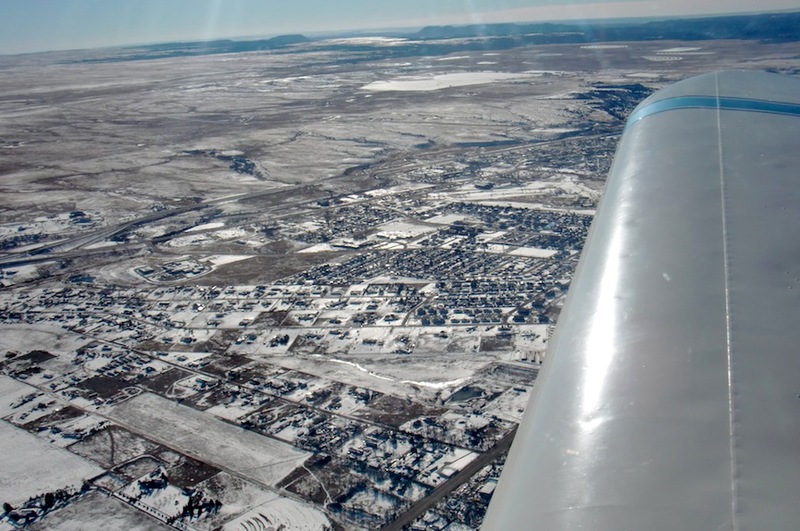 But despite all my advanced worry, and the Maalox Moments as I rolled onto my final course that scooted around the edge of Sandia Crest, under the lip of the Class C airspace, and over the suburb city of Rio Rancho, everything went smoothly for once. I listened to the airport info, contacted the tower with information Victor, and was cleared for a straight-in approach to runway 22. I didn’t put my foot in my mouth even once, and even my landing was smooth as silk. Once off the runway, we correctly changed frequencies, contacted ground control, and got instructions on where to find our destination: The Aspen Avionics Hangar. Aspen, despite making their space available for all kinds of educational gatherings at Double Eagle, doesn’t seem to do a good job on publicizing their location and I was unable to divine their whereabouts on the field in advance. I even searched for the hangar using the Google Earth map, as flight planning requires the use of all available resources. When informed we were first-time visitors, the ground control folks were kind enough to tell us which taxiway to take and where to turn. We pulled up to a row of visiting planes and shut down. Oh yeah! Little Podunk me in my near-antique airplane playing with the big boys! My chest filled with pride and my confidence meter pegged at 110%. But speaking of wing stretches, what in heaven’s name inspired Rio and I to fly into Albuquerque in the first place? We went to attend the Second Annual Angel Flight Fly-In. And what was that all about, you ask? Well, that’s a story unto itself. I was using part of my lunch hour to check the weekend weather when one of my colleagues dropped by to give me her condolences on Mick’s passing. Her keen sky-blue eyes caught sight of the weather maps on the company computer and she asked what I was up to. I launched into a perhaps inappropriately enthusiastic description of my plans to take Mick for a ride. 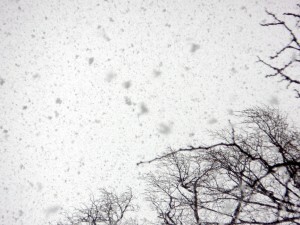 We got a second chance, thanks to the crappy weather, I told her, the snow was so bad her internment was delayed. Looks like we can take her for her last flight after all. Oh, I told her, We’re not scattering her ashes, we’re just taking the urn for a ride before it’s buried. OK. Now that would be just… wrong. Sunday dawned clear and bright with not a breath of wind. 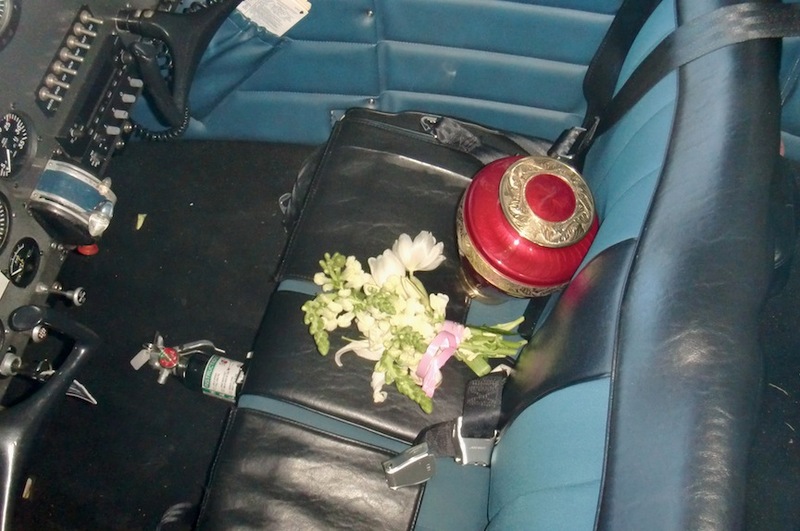 I gently lifted Mick’s heavy urn into the Plane Tales Plane and placed the bouquet of flowers that Deb had made from the wreaths and sprays that decorated the altar at her mother’s service on the seat next to the urn. Then I preflighted Tess. I checked the oil and added a half-quart. I made sure no mice or birds had made nests in the engine, drained a few ounces of blue av-gas out of each fuel tank’s sump drain to ensure that no water had gotten into the system, then did a walk-around—gently caressing the leading edges of her wings, prop, and tail, and checking the hinges of all the control surfaces. Then I pulled the hangar doors wide open and pulled Tessie out into the sunshine. It was a great day to fly. Just shy of the runway, we stashed Mick safely in the luggage compartment behind our seats, did our run up, set our radios, and tried to synchronize our GPS to our iPad. With no luck. We do this old-school, I replied, we fly by landmark. Then I made my radio call, pushed the throttle forward, and rolled out onto Runway 01. I lined up smartly on the center line and advanced the throttle smoothly to the firewall. Tess began her takeoff roll, and then suddenly everything went deafeningly silent. The engine stopped. The propeller lazily spooled down and stopped turning. The plane slowly coasted to a stop about fifty feet down the runway. We sat there in the middle of the runway in the bright beautiful sunshine in dead silence, stunned, while my mind tried to process what had just happened. I had a momentary vision of Tony dragging Mick across the tarmac to their car. I shook my head to clear the thought, shut everything down, then turned everything back on and pulled the starter. The engine obediently roared to life. I made a U-turn and taxied back to the runup area. I tested, and fiddled, and ran the throttle up and down. Everything seemed fine. I still have no idea what happened. At least it happened on roll out, not 50 feet in the air. We took off and the engine ran fine for the rest of the day. Snow still decorated much of the landscape below, and the cool early morning air was decently smooth. We hit the occasional bump, reminders that the air is alive, but nothing too disconcerting. We sailed over Santa Rosa Lake, then I aimed Tessie’s nose for the distant notch in Apache Mesa that I knew would lead us to Las Vegas. We cruised up the Gallinas River Canyon, slowly gaining altitude, popped out the other end and soared over Las Vegas at 1,000 feet above the city. Around we went, once, twice, thrice. I climbed slowly, thinking it might be a nice day to visit Hermit’s Peak, but at 8,000 feet ripples of wind coming off the tops of the San de Cristo mountains turned the air into a churning torrent of turbulence that shook and jolted our tiny craft like a raft in a stormy sea. I slid the throttle back and let Tessie drop back under the layer of angry air, and turned for Storrie Lake where we planned to drop the bouquet in one last ritual for our departed crew member. As we approached the target, I slid my door down halfway into the belly and an icy blast of wind tore though the cockpit. I reached up and slid Deb’s door up and over to the left until it touched mine, leaving her side open like a car’s window. I leveled the wings and realized that I had no idea when to drop the flowers to “hit” the lake. Get ready, I told Deb as the lake filled the windscreen. As the shoreline passed under our nose, I told her Now and she reached out and let the flowers go into the slipstream. The bouquet disappeared in an explosion of ivory pedals and green leaves. Over the lake now, I could see that it was frozen over. I slid the copilot’s door back down to the right and pulled mine up into place. The icy breath of Father Winter was choked off and the distant roar of the engine through my headset was the only sound. I throttled back and banked right into a shallow turn. (Debs isn’t a lover of steep adrenalin turns like Rio, Lisa and I are.) We gently corkscrewed down, down, down, down. I scanned the ice but saw no sign of Mick’s flowers. Maybe we missed the lake and they were buried in the snowbanks on the shore. 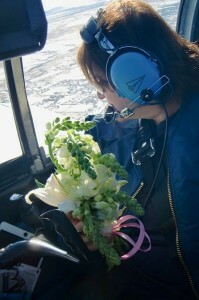 Maybe the bouquet disintegrated into individual flowers that fell like snowflakes onto the ice, each too small to see from our lofty perch above. We’ll never know. But were getting low. Low on altitude, low on fuel. I powered up, lifted the right wing and turned for the Las Vegas field. We’d kept our promise, in spirit, at least. I guess Tony finally decided to let Mick have her flight. And I’m sure that as we took her mortal remains for her first flight, her spirit took wing on her final flight, to be with Tony again, somewhere in the sky, high above us. Is too late better than never? For decades Mick, my mother-in-law, was pissed at my father-in-law over an airplane ride. I never learned the exact details, but apparently sometime in the early 1960’s a latter-day barnstormer came to the sleepy burg of Las Vegas, New Mexcio, offering plane rides. Mick, in her younger years, had a great sense of adventure and was always up for something new and exciting. But my father-in-law, Tony, was a more cautious type who “knew” that all planes crashed. He was so sure of this fact that in his whole life he never once flew in any plane, large or small. I don’t know the exact sequence of events, but apparently Mick was strapped into the plane and ready to go when Tony literally dragged her out of the airplane, across the tarmac to their car, and took her home. I’m not sure if she had gone to the airport with friends and he got wind of it and followed, or if they went together with him thinking they were just going to watch the plane and she signed up while he was in the bathroom, or if he was initially OK with her flying and then got wet feet. But apparently it caused quite the scene. She was embarrassed and humiliated, and to top it off, she didn’t get her plane ride. She was still mad as hell about the incident twenty-seven years later when I joined the family, still mad for another decade until my father-in-law died, and still simmered for another 15 years after he was gone. Mick was pretty good at not letting anything go. So naturally, when we started shopping for an airplane, I promised Mick her long-overdue plane ride. She was very clear that she wanted to circumnavigate Vegas from the air; and I was very clear that it would need to be a perfect flying day to make it happen. After all, this was a woman who got airsick on porch swings. But it’s a promise I never kept, damn it. One thing after another always seemed to get in the way. Of course the Plane Tales Plane spent the first six months of her life with us in the A&P’s shop. Along with other members of the family, Mick visited Tessie at the mechanic’s shop, and you could see a glint of anticipation and longing in her eye. But while Tess got progressively fixed up, Mick progressively fell apart. Her assorted degenerative diseases began to take their toll on her body and mind. Walking became harder and harder, stairs a nearly impossible challenge. I had my handyman install a grandiose double-sided ramp for access to the house and pondered how I’d get the frail lady up onto Tess’s wing and over the high fuselage wall and into the cockpit. 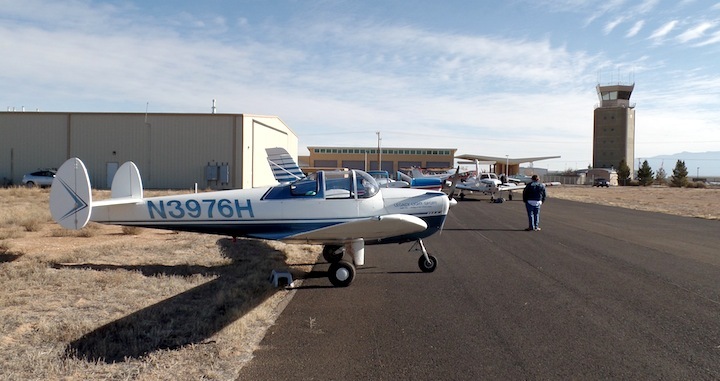 Getting into an Ercoupe is something like getting onto a horse. Well, worse. More like getting into one of those boxes on top of an elephant. Then Mick’s dementia began to come and go like the tide. One week she’d be laughing, telling jokes, and making keen—if wicked—observations about the latest shenanigans of the local politicians. The next week she’d come out of her quarters and ask who I was and what was I doing in her house. (She was actually living in my house, but there’s no point in arguing with someone who doesn’t recognize you…) I desperately wanted her first flight to happen on a “good” week and hoped the experience would imprint on her failing mind so that she’d be able to remember it. I also worried about safety issues. Sometimes her behavior was bizarre and bordered on violent. What if she flipped out on me and grabbed the controls on short final? And the obstacles didn’t stop there. We bought our plane after a decade of drought and perfect flying weather 365 days a year. Naturally as soon as we owned a plane, the drought promptly ended, and we’ve had some of the most airplane-unfriendly weather I’ve ever seen. Much needed rain soaked the parched desert and left Tess trapped in her hangar. Then we had fog. For days. Seriously? Fog in New Mexico? I got good at checking the dew point spread when checking the weather. When it wasn’t foggy, it was windy. And not just a little bit windy. One day the windsock on our back porch literally flew away. To add insult to injury, the weather had vexing timing: What good weather days we had never seemed to line up with my flying days. The one time that weather was great and Mick was in fine shape, I came down with a nasty flu bug. I idly wondered if the spirit of my dead father-in-law was still trying to prevent Mick’s flight. The delays and re-scheduled flights became the norm, and every time our mission was “scrubbed,” I just said to myself that it was no problem, we can still do this another day. At Christmas this last year, Mick was happy, smiling, and engaged. She talked more than I’d heard her talk in months. Once again I got out my calendar, looked at available dates, and optimistically wrote “Fly Mick” on a Saturday January 24th, and drew a starburst circle around it like I’d done so many times before. She died Saturday, January 17th. She was cremated, and following local tradition, services were set for the soonest day available—in this case the following Thursday. It occurred to me that while it was too late to keep my promise in a meaningful way, I could still keep it in spirit. Cautiously, I breached the subject with my grieving spouse: What do you think of taking your Mom’s ashes for the flight we kept promising her? Somewhat to my surprise, Debs loved the idea. We arranged to pick up the urn the day before the service, and planned an early morning flight. Mick would fly to her own funeral. But my father-in-law’s ghost struck again! 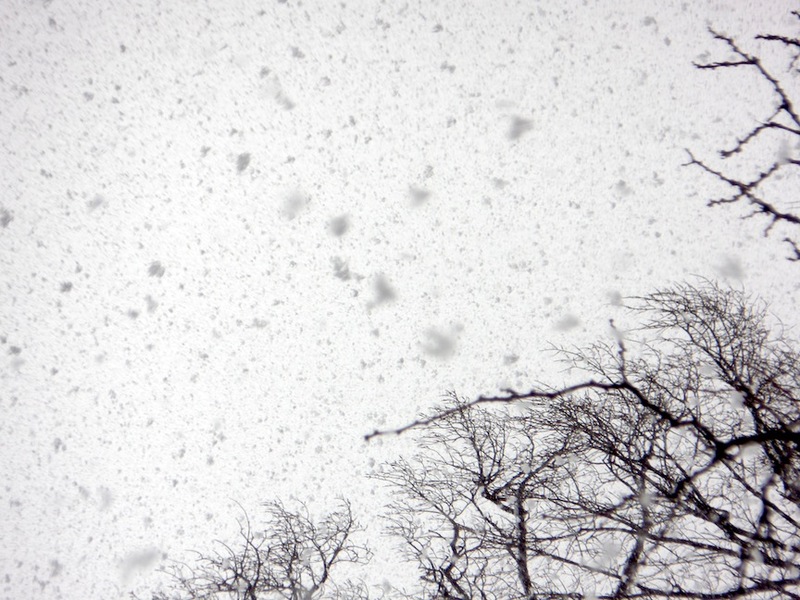 The night before Mick’s funeral, a fierce blizzard hit. Dawn arrived with blowing snow and near zero visibility. Driving with the guest of honor in our Jeep, we barely made it to the church on time. I was pretty down on myself about not being more aggressive at getting her into the air as promised while she was still alive. Next time on Plane Tales: Will Mick finally get her flight, or was it never meant to be?